Mischief Comes to ‘Hand of Fate 2’ as Goblins Invade… Everywhere! Mischief. Such a delightful word, and approximately 48 hours ago, it invaded Hand of Fate 2. Kinda. In the way that Mischief is the name of a goblin faction, now part of the game. Everywhere. In every mode. No one and nowhere is safe! Complete, utter madness… and so darn groovy. As for exactly what the goblins wants, what they’re plotting, and such – well, that’s a bit of a mystery, really. According to the announcement, their goals are “a mystery, their methods confounding”. Not exactly the kind of thing that’ll fill players with confidence, ya know? That said, a note was also made about how “a valuable goblin-vanquishing artefact” can be acquired. If you’re impressive enough. Or something along those lines. So there’s hope yet. On a somewhat related note, remember how Hand of Fate 2 got Endless Mode last month? 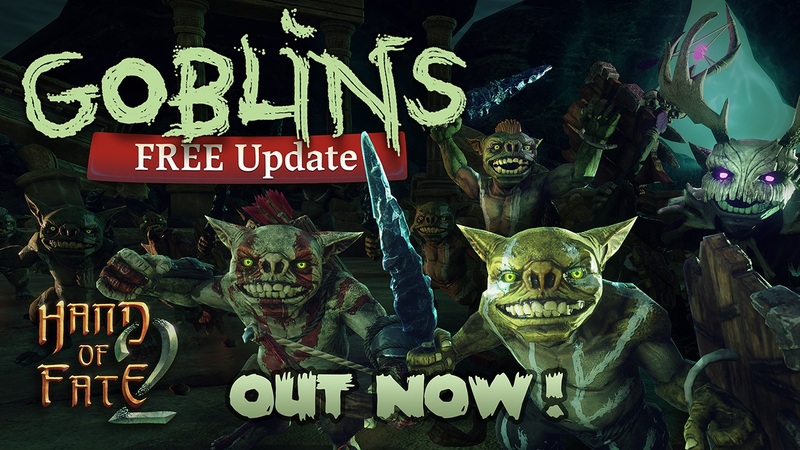 Well, that too has goblins in it (and bug fixes/balance improvements)! Told ya they were everywhere. And if, for some reason, green is not your favorite color, that same update does bring about more general stuff: improved load times, graphics optimizations and – my personal favorite – an option to remove hit pause. So, green is da best?